Oracle Placement Papers PDF Download 2017-2018 | Aptitude, Reasoning & Verbal Ability Model Papers. Contenders who are in the preparation for Oracle Placement Papers they are at correct place. The Oracle Placement Papers are helpful for aspirants while preparing for the Oracle Placement Online Test. Aspirants have to be aware of the Oracle Test Pattern and Model Papers before attending for the Oracle Recruitment process. 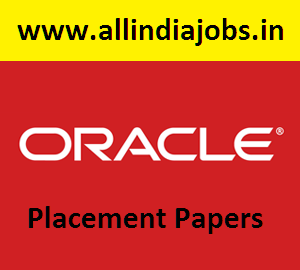 Read the complete article to know more updated information about Oracle Placement Papers. To qualify the Oracle Online written test, preparation is very important. To crack a job in Oracle company, you have to know the Oracle Test pattern and model questions. As we know that Oracle is one of the leading IT Company. Everyone has a passion to join in Oracle organization. In this page, you can get all the latest information of Oracle Placement papers and make easy for your preparation to get selected in Oracle Recruitment. Keep on visiting our site All India Jobs frequently for current updates. Oracle Interview Questions and Oracle Model Papers are designed carefully to support the job seekers. Competitors have to practice Oracle Placement Papers so that contenders will get an idea about Oracle Test Pattern. By practicing these sample questions according to the Oracle syllabus it will help the aspirants to analyze their performance level comparable to selection tests conducted by Oracle. This analysis will useful for aspirants to identify their areas of weaknesses which will provide them to enhance their performance and help to crack the Oracle placement test. Aptitude test questions are given in this article, for the better preparation of the candidates who had applied for the Oracle Recruitment Test. Do practice these questions to get qualify in the Oracle written test. A call stack or function stack is used for several related purposes, but the main reason for having one is to keep track of the point to which each active subroutine should return control when it finishes executing. A stack overflow occurs when too much memory is used on the call stack. Here function main() is called repeatedly and its return address is stored in the stack. After stack memory is full. It shows stack overflow error. Option A is correct. A Map cannot contain duplicate keys. Option B is wrong. Lists typically allow duplicate elements. Option C is wrong. Collection allows duplicate elements. (1), (2), and (6) are correct. They are all related to the list of threads waiting on the specified object. (3), (5), (7), and (8) are incorrect answers. The methods isInterrupted() andinterrupt() are instance methods of Thread. The methods sleep() and yield() are static methods of Thread. D is incorrect because synchronized is a keyword and the synchronized()construct is part of the Java language. D.Neither A nor B are correct. A.use FROM to name the source table(s) and list the columns to be shown after SELECT. B.use USING to name the source table(s) and list the columns to be shown after SELECT. C.use SELECT to name the source table(s) and list the columns to be shown after USING. D.use USING to name the source table(s) and list the columns to be shown after WHERE. D.Both 1 and 3 above are in the OBDC core API. D.binary search algorithm is not efficient when the data elements are more than 1000. A.Both windows behave the same way as far as moving the window is concerned. Runtime error: Abnormal program termination. assert failed (i<5), NOTE asserts are used during debugging to make sure that certain conditions are satisfied. If assertion fails, the program will terminate reporting the same. After debugging use, #undef NDEBUG and this will disable all the assertions from the source code. Assertion is a good debugging tool to make use of. p is pointing to character ‘n’. str1 is pointing to character ‘a’ ++*p. “p is pointing to ‘n’ and that is incremented by one.” the ASCII value of ‘n’ is 10, which is then incremented to 11. The value of ++*p is 11. ++*str1, str1 is pointing to ‘a’ that is incremented by 1 and it becomes ‘b’. ASCII value of ‘b’ is 98. Now performing (11 + 98 – 32), we get 77(“M”); So we get the output 77 :: “M” (Ascii is 77). 22. If you need to duplicate the entire disk, which command will you use? 24. Which SQL trigger does SQL Server NOT support? 27. In a CLIENT/SERVER environment , which of the following would not be done at the client ? In this page, we deal the Reasoning test questions. Are you weak in Reasoning? then candidates can practice the Reasoning Questions and answers which are given below. Practice more and get success in the Oracle Recruitment Test. Each term of the series is obtained by multiplying the preceding term by 3. Missing number = 13.5 * 3 = 40.5. “The city’s top ranker for SSC examination this year will be definitely from our school.” – Principal of a school ‘X’. I. The teachers of the school have prepared their students thoroughly. II. Most of intelligent students in the city are studying in school ‘X’. As a principal, he trusts his teacher that they would have prepared the students thoroughly. So that they could appear in the list of toppers. Hence I is implicit. Only intelligence cannot be the basis of the Principal’s statement. Hence II is not implicit. 5. The number of instances where judges have made unwanted remarks in open courts against other constitutional/ statutory bodies or persons who were not before them is increasing. There is a need to bring such behaviour of judges within the purview of judicial standards. Which of the following can be inferred/concluded from the given information? Choice (A) is the inference. 7. Young is related to old in the same way as wide is related to? 8. (A) A disease called conjuctivitis (also called Madras eye) prevailed in the state of Andhra Pradesh where one in every five people was effected. (B) A large number of people from Madras migrated to Andhra Pradesh. The disease has no relation with people of Madras. Hence, (A) and (B) are effects of independence causes. 10. A fruit basket contains more apples than lemons. What is the sum of the two resultant number of the set of the number given above? A. take the purse away. B. take out the money and leave the purse there. C. deposit it at the nearest police station. D. stand there and wait for the owner. stand there and wait for the owner. Students attendance in regular colleges is falling day by day, while in private coaching centers the situation is just the opposite. I. Students must be given individual attention. II. At least once in a week they must be given a test. III. Without proper attendance, a student must not be allowed to attend the final examinations. Course of action I is based on the assumption that the students are not attending the class due to lack of individual attention, hence I does not follow. For the similar reason course of action II is not proper course of action. II is not a proper course of action. Course of action III force the student to attend the class without solving the problem of not attending the classes. Hence, III does not follow. Contenders can practice the English test Model questions on this page. We suggest the candidates prepare well for the Oracle Placement test before appearing. 1. They have waited here for four hours. 2. The goal of any company is to have its product name become ______constantly at the forefront of the consumer’s mind. 5. He is used ________ such hardships. 6. Have you seen the recent Hollywood films. 7. We ———————- for the examination. 10. He is angry with me _________ my carelessness. Tribute and accolade (praise) are synonymous. 12. Lynette had to learn the ______ of the insurance profession before she felt comfortable describing products to her clients. Lexicon (n.) is the vocabulary used in a language, profession, class, or subject. 13. Normally distinguished and reserved, Robert would act ______ when he joined his friends to cheer for their old high school team at annual the homecoming game. Oafish (adj.) means acting stupid, goofy, or clumsy. We hope the above information given about the Oracle Placement Papers which will be useful for the aspirants to get prepare easily. Not only these Placement Papers but also we update the latest information of all IT companies career opportunities, Interview Questions and also Test Pattern. Keep Visit our All India Jobs site regularly.